When I was 14 my family and I took a trip to Tunisia where I went paragliding over the Mediterranean Sea. The operators liked me so much, they offered to take me out on the boat, to show me around. To this day, this is still one of my most favorite memories of all time. We must have cruised up and down the coast for hours. The skipper showed me all kinds of fish, pointed out landmarks and in general made sure that I was enjoying myself, which I did, tremendously. This was also my very first time on a boat, it was the first time that I realized that you could fall in love with not just someone but with something. 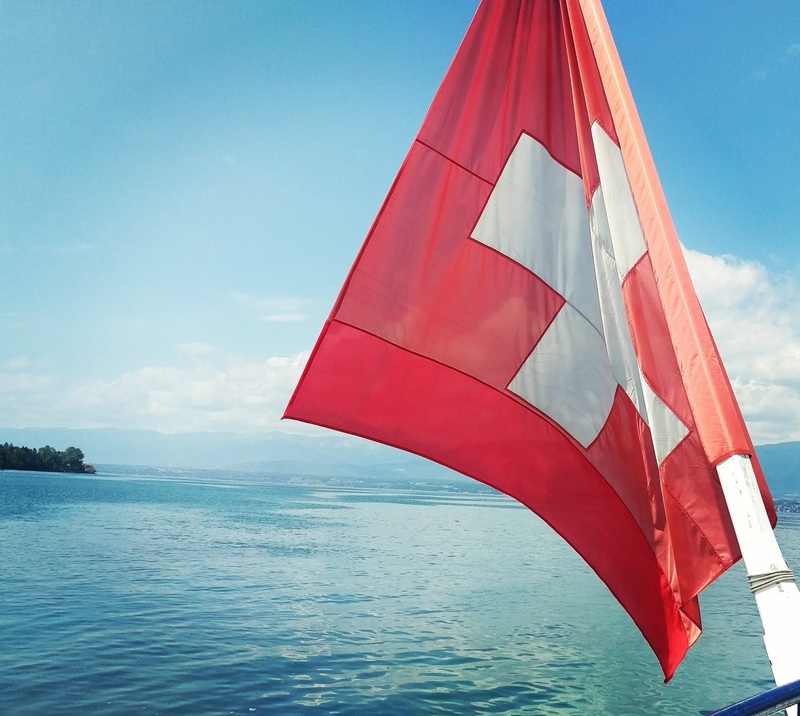 Needless to say, this wasn’t the last time I spent on a boat, but it helps in explaining why in my two days in Geneva, I spent 95% of my time on a boat (the other 5% I spent looking for chocolate – naturally). Geneva was very different from what I expected. I suppose having chocolate fountains on every corner and huge clockworks was not realistic. I guess Charlie and the Chocolate Factory really did a number on me with the imaginary chocolate heaven… I am not a mountain person or a lake person and I will most likely never be one, but given the choice of being on water or land, I will always choose water over land, which is ironic, given my proneness to sea-sickness. So, the second I was on my own in Geneva, I headed straight for the lake and found myself on a boat minutes of arriving. The sun was beating down relentlessly, which seemed like a gift at the time, given that Norway’s summer has not been very summery as of late. I knew that being on water would increase the chances of sun exposure and I’d like to think that I did everything to prevent sunburn, but truth to be told, I didn’t. If I did, I wouldn’t have suffered a severe sunburn, simple as that, but being a water person, even on a boat I needed to be close to water, or as close as I could possibly get to the water, without jumping off the boat, which meant sitting on the edge of the boat… Much like my all-time favorite: Augustus Gloop, this is basically what I did, although, I’d like to think a bit more fashionable than that. We are all different in that way, some of us will love something so much and they will feel endlessly loved by that something, it might not seem like a struggle for them at all. But the majority of us will try to love something with all they have and will eventually realize that it is unrequited love. And that realization crushes you, because, no matter what you do, it won’t love you back. If you ever confessed your love for someone and they didn’t love you back, you remember that awful gut-wrenching feeling, right? But what if that someone is a something, not tangible, no words forming on their lips, no eyes to look into, no hands to hold, an object, a feeling, a something that you simply cannot grasp, no matter how hard you try? What then? There’s no easy answer. I’ve been wrecking my brain trying to figure this conundrum out, what to do with unrequited love for something (now there is a title for a self-help book). And this is the conclusion I came to: Unrequited love is soul crushing, it’s heart-breaking and the realization of it can break you. But unrequited love could also mean that you work twice as hard, twice as long and twice as strong to make sure that the love will stay with you forever. Sometimes you will fail, you won’t have the career you want, you won’t have achieve the goals you set for yourself and you simply may never be the best at whatever you set your mind to, but you do not give up. That’s what sets you apart, your determination, your devotion and your love for something, that might seem to not love you back. I’m not saying that unrequited love eventually will become love, that would be a lie. But unrequited love doesn’t mean that it’s lost love, or that you won’t be able to love something else (or someone else). I believe that unrequited love is what drives us as human beings. It’s what keeps us awake in the middle of the night. I know that the career I chose for myself might not be the career that chose me and looking for the right position is an awful process. It’s discouraging, heart-breaking and makes me question my sanity every single day, but see that doesn’t make me want to choose something else, perhaps something easier. On the contrary, it’s kind of like being on a boat: I love the ocean and all it has to offer, but while I love it, I’ve been sunburned (severely) more than once and my stomach is in knots just thinking about boats sometimes, but still I will always come back to them. Boats definitely don’t love me but I dare you to try to keep me away from them, and someday, I will actually own my very own boat and sail across the seven seas. And I already know the perfect name for my boat: unrequited love.